A "red ffyry dragon peyntid upon whyte & Grene Sarcenet" was one of the banners offered by Henry VII at St. Paul's Cathedral in thanksgiving following his victory at Bosworth . Henry claimed descent from Cadwaladr, the great Welsh King traditionally called "the last king of Britain", whose dragon symbol, redolent of bravery and fierceness, had been taken up by later Welsh Princes. 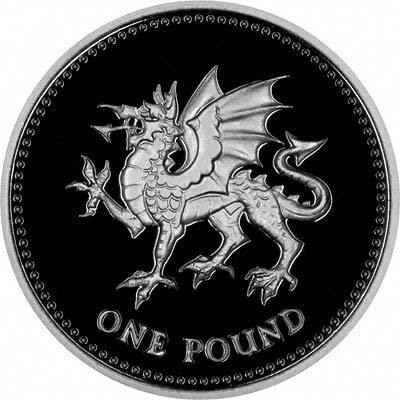 The dragon was favoured by the Tudor monarchs and is found in Tudor manuscripts, on the Tudor seal for the Principality of North Wales and even, according to the Royal Mint, as a supporter on the obverse of gold sovereigns of Henry VII. In fact the Mint are mistaken in this, it appeared seated on a column by the side of the throne on sovereigns of Henry VII, and it appeared later as a supporter (to the armorial shield) on sovereigns of Henry VIII. It was much in evidence at the pageantry for the reception of Catherine of Aragon in 1501 and , later, when Henry VIII took the field at Calais in 1513 he bore a standard with "the redde Dragon". A red dragon on a green mount has since been officially recognised as the Royal Badge of Wales; and it was the present Queen who in 1959 declared that the flag of Wales, now so familiar, should show the red dragon on a green and white field. The earliest mention of the red dragon as a national emblem of Wales appears in Historia Brittonum, written in Wales in the early ninth century. It tells the familiar story of the battle of the red and white dragons that raged beneath the site of Vortigern's fortress in Snowdonia, the red dragon at first having the worst of it but finally overcoming the white. The combat was taken to symbolise the struggle between the Britons and the Saxons and foretold that the Britons, after long years of oppression, would one day drive the Saxons back across the sea. From that time the red dragon was linked with the great Welsh Princes and it is entirely appropriate that it should eventually have been chosen as the Royal Badge of Wales. The first dragon to appear on British coins was during the reign of Edward IV in about 1464. It was on a new coin denomination called an angel, which had a value of 6 shillings and eight pence (6s.8d. ), or one third of a pound, this was the equivalent of the mark. There were also half angels, issued from 1491 to 1619. The reverse design of the angel showed St. Michael (we will probably receive a letter from Marks & Spencer's solicitors) depicted as a winged angel spearing a dragon. Angels were issued until the reign of Charles I in 1642 . In the reign of Henry VIII in 1526, another dragon appeared, again on a new coin denomination, the George Noble. The angel had just been revalued to 7shillings and 6 pence, and the George noble replaced it with a value of 6 shillings and eight pence. This dragon fared no better than its predecessor, this time shown being speared by St. George, who was depicted on horseback, wearing armour, and with a prominent George Cross on his tabard. There was also a half George noble of similar design. Both of these noble designs were soon discontinued, and were certainly not used after 1544. The most famous dragon to appear on British coins was, and still is, the design by the Italian engraver Benedetto Pistrucci, which first appeared on gold sovereigns of George III in 1817. This again showed St. George, naked except for a cape flowing behind him, and helmeted, on horseback, with a sword in his right hand, about to slay a dragon. This design by Pistrucci, had earlier been used on a medallion. It was adopted for use on crowns (five shillings), the next year. It was also used on five pound coins and two pound coins from 1820, and on half sovereigns from 1821 in George IV's reign. Pistrucci's design was not used on coins of William IV, or early Victorian coins, but reappeared on Victorian sovereigns in 1871, it was continued on half sovereigns, two pounds, five pounds, and crowns from 1887. It is still used on sovereigns, half sovereigns, two pounds and five pounds today, and was used on crowns until 1951. In 1935, a stylised version of the same design was used on the silver jubilee crowns of George V.
The dragon was also used as a mintmark on gold coins of Henry VII, the only British monarch for whom the dragon mintmark has been used, apart from this, all the dragons featured so far were being killed by heroes. In 1984, a series of designs were started on One Pound coins, with emblems of the four constituent parts of the United Kingdom. The first series of these, starting with Scotland, showed the national plant of each country encircled by a Royal diadem (crown), this series was repeated until 1993. In 1994, a new series of emblems were used, showing a rampant lion for Scotland, three lions for England, a Celtic cross for Northern Ireland, and in 1995, a Welsh Dragon. The famous red dragon of Wales, shown passant with wings elevated as it appears on both the badge and flag of Wales, has been modelled by Norman Sillman from a drawing by the College of Arms. Like its counterparts of 1985 and 1990, the new Welsh £1 coin carries the edge inscription "PLEIDOL WYF I'M GWLAD", taken from the Welsh national anthem and meaning "true am I to my country". So far this particular dragon has appeared on pound coins of 1995 and 2000. It is possible that a new series will be started before 2005, or that the pound will have been replaced by the Euro by then.